While we are far, far away from being ready for our close-up, Mr. DeMille, I simply cannot wait any longer to show you a very brief sneak peek of our home. Our Carleton V Brazilliance wallpaper went up yesterday, and I could not be more delighted!!! I cannot stop starring at it! I have wanted this wallpaper for soooo long, and after permitting delays followed by renovation delays followed by delay after delay after delay, I was starting to think this day would never come! But here it is, in all of its banana leaf splendor. Our Labradoodle, Marilyn Monroe, likes the Brazilliance too! I would like to give a huge shout out to our fabulous wallpaper installer, Robert Gagner. Bob is truly an artist, and he has been in business for over 30 years. Anyone who lives in South Florida knows it is next to impossible to find excellent service around here, and Bob far exceeded my perfectionist expectations. Stay tuned as Bob will be installing my faux Gournay next week!! Our fabricator is still ironing out a few kinks, but our kitchen is also coming along slowly but surely… I adore classic white kitchens, and I’m thrilled with the way ours is turning out! Here’s a glimpse inside our master bathroom… Again, it is still a work in progress but here is our steam shower. Hopefully we will get to use it soon! And that’s it for now! A very brief update indeed… Pretty much everything is still a giant work in progress, including our family room. We are stilllll awaiting our custom entertainment center, and until then, here is a sad glimpse of the get-up we’ve got going on in there. The TV is actually sitting on the floor. It’s kinda like living in a frat house. Go Noles! It's absolutely AMAZING! I would just stare at it all day too! Keep giving us sneak peeks! I love to see the progress! I have been waiting and waiting for this wall paper moment…..I just scrolled and stared at it. True perfection Andrea. Better than I could have imagined. I can't wait to see how you fill it up. The bathroom instillation of your slabs is top notch too. What joy to finally move in…. WOW! Fab indeed! I can see all your vision & you are taking some exciting risk which are turning out just right! Can't wait for More! Your home looks FANTASTIC! That kitchen is too die for, and the wallpaper looks great. I'm so excited for you, Andrea!! Everything looks absolutely INCREDIBLE! Looks fabulous! I just sold another pair of Brazilliance Pillows to a happy customer looking to do wallpaper also. IT'S UP!!! So exciting! Congrats, Andrea! And the kitchen is stunning so far! Wonderful, I cannot wait to see this! I always worry that something will happen to my Martinique paper, it cost me a fortune in import taxes, and a huge fee from an American designer just to find it for me, it makes me sick to think of what I finally paid for it, if anything does i will be begging you to source that one above for me! Faux Gournay – oh I'v e been looking for similar for ages, can't wait! Everything is looking SO good! Can't wait to see your dining room when you're done. Go Noles! My husband and I are both FSU amluni! Loving the wallpaper more than I thought I would. Everything looks so polished and high end! Can't wait for it to be done and the furniture in and styled. Andrea, FANTASTIC!! Love all the wonderful changes you are making to your home. Can't wait to see your room full of furniture!! You are off to an incredible start!!!! That wallpaper is amazeballs. I do love that dining room wallpaper. So whimsical and bold! And I agree with you – classic and white is the only way to go in the kitchen! You're off to an amazing start! I am SO excited for you, and majorly jealous! To die for! Utterly fabulous! I've just found your blog and foresee many hours lost… Having just fallen in love with the deG willow paper, I am on tenterhooks to hear how your faux panels turn out – did you indeed source them from InGrandDesigns, the ebay link you mentioned? I can't believe I missed this. Holy cow, do I love your home. Andrea, you have done an amazing job with keeping to your style. I struggle with that all the time. I don't think I knew you had a cute dog. Oh my gosh it looks wonderful! I'm so far behind and have not been commenting lately….I'm so sorry. Your house is going to be amazing. 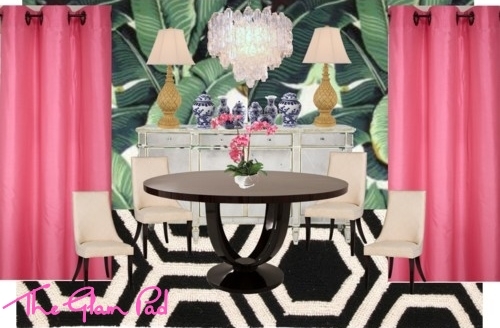 I'm a sucker for wallpaper and your dining room…..BANANAS!!! Love it!! can I please come to dinner?? ?